The Hamilton Canal Innovation District is among the best opportunities in the Commonwealth to achieve a transit-oriented, waterfront development in the heart of Lowell, a vibrant and vital city. 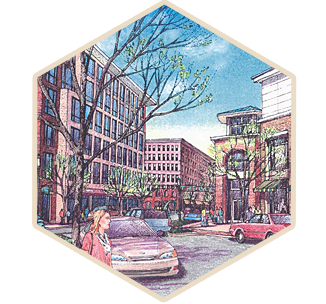 The Hamilton Canal Innovation District can serve as a model for the smart-growth development strategies that are being advocated by national leaders, state officials, and the City’s own Comprehensive Plan “Sustainable Lowell 2025.” The carefully planned district master plan aligns with Governor Baker’s ongoing goal of quality multi-unit housing, transforming the real estate markets in Gateway Cities, and the creation of innovation and entrepreneurship clusters, which is already underway with the University of Massachusetts Lowell’s new Innovation Hub. The Hamilton Canal Innovation District is a unique opportunity to transform the City on a scale paralleled only by the City’s founding. Interested in receiving updates about the Hamilton Canal Innovation District?